We're located at 5600 64th St. NE in Marysville, Washington. We're near Jennings Park, the YMCA and Allen Creek Elementary School. ​When is worship? Sundays at 8:30, 9:45 (contemporary) and 11:00 am (traditional). The 8:30 & 9:45 services features our Song Team, a prayer time with candle lighting, scripture reading, a message from our pastor and giving our offering. Children are invited to worship with their families and then a Kids Club is available during the rest of the service. Children return to worship during the last song. The 11:00 service features our Chancel Choir, our organ and rich traditional liturgy. We have a prayer time with candle lighting, a time for our children, scripture reading, a message from our pastor and giving of our offering. Children are invited to worship with their families then Kids Club is available for PreK-6th grade during the rest of the service. Children return to worship during the last song. Our pastor will preach a message based on a scripture passage and a theme relevant to our daily life. We pray that God’s spirit is at work through the pastor’s study and prayerful preparation. What should I wear? It's the Pacific Northwest, so people pretty much wear whatever they feel comfortable in. At all services, you'll see people dressed up, in jeans, workout clothes or even wearing their rain coat. Child care is available for all who need it, but we recognize that some families might want to keep children with them in church. Children are welcome to stay throughout the service. Baby noises don't bother us! Most of our services have special children’s times with a special message just for children. Differently-abled persons worship regularly at Marysville UMC. We do our best to accommodate all persons, even when it means some minor disruptions may occur in worship. We are a family, and families accept one another’s differences. Need a ride to worship and live in the Marysville area? We'd love to pick you up in our church van. Contact our office at 360-659-8521. 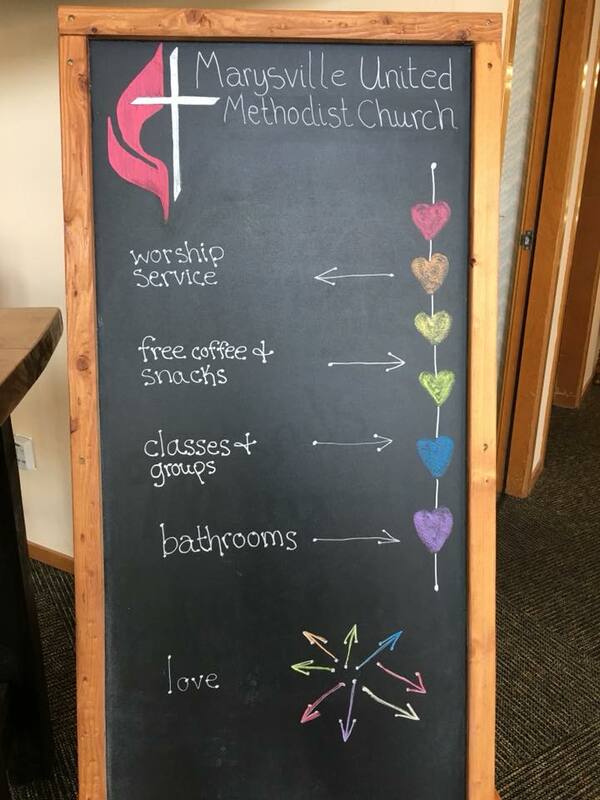 Marysville UMC is a welcoming and reconciling congregation in the United Methodist Church. You won’t hear words of condemnation in our church. 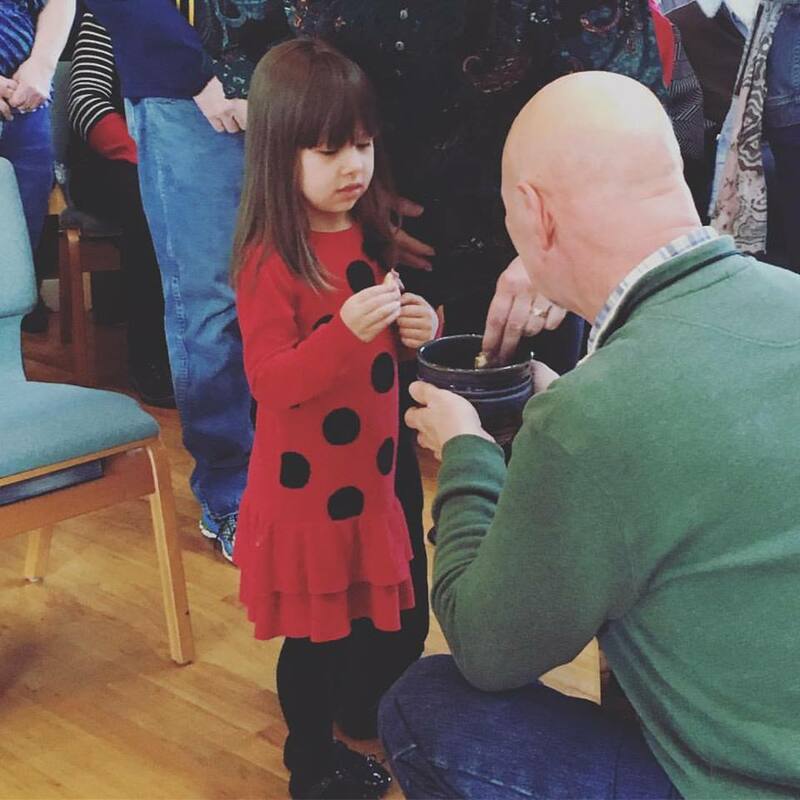 We celebrate the sacraments of communion and baptism together. Learn more. There are two parking lots with easy access to the building. Come a couple minutes early to park and make your way inside. You'll be welcomed with a smile and hand shake but we won't make you stand up and introduce yourself! When and if you're ready, you can connect with someone at the Welcome Center outside the sanctuary or fill out an insert in the bulletin to receive more info about our community.